Recently, on the stages of two capital cities–Warsaw and Kyiv–there appeared singular examinations of the rural component of the Ukrainian and Polish national identities. 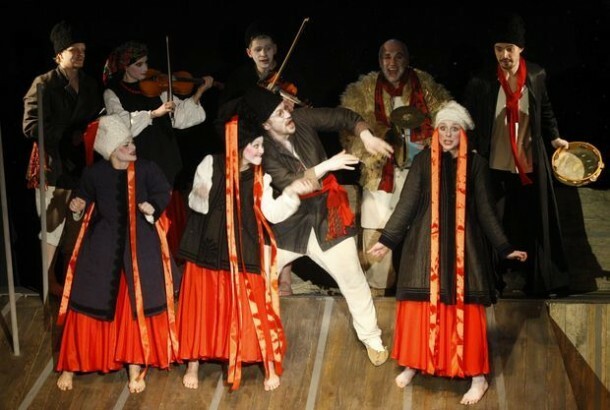 Premiering in the beginning of February of 2013 at Kyiv’s Ivan Franko National Academic Ukrainian Drama Theatre was Dmytro Bohomazov’s staging of Morituri te Salutant. Every Day a Holiday, drawn from the novellas of Vasyl Stefanyk. 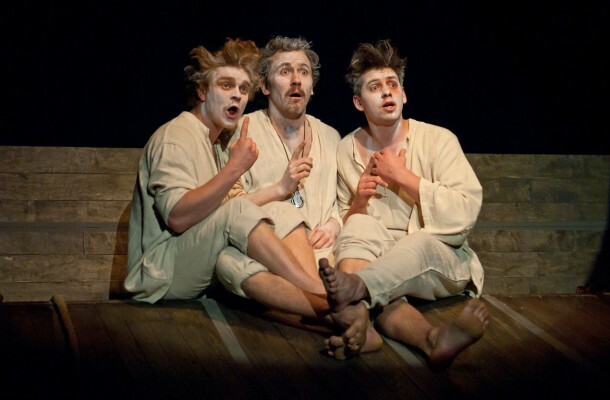 A year earlier, in a co-production of the Warsaw Drama Theatre and the Kraków “Divine Comedy” Festival, Monika Strzępka brought contemporary Polish playwright Paweł Demirski’s In the Name of Jakub S to the stage. Dmytro Bohmazov is widely regarded as a leader in experimental Ukrainian theatre, perhaps its most dynamic director of the contemporary stage. He is a recent recipient of that most esteemed–and most controversial–of Ukrainian State honors, the Shevchenko National Prize. Monika Strzępka has garnered recognition for a succession of productions of the work of Paweł Demirski. The pair work together regularly and are credited by Polish critics with reintroducing themes once considered of marginal interest into the mainstream. The heart of their work is marked by an edgy social, economic, and historical perspective, with nearly every new staging resulting in a fresh group of Polish festival prizes for Strzępka. What unites these fundamentally different directors –at first glance– is their interest in dated rural themes. As is the case in both contemporary Ukraine and Poland, the difficulties of rural life are hardly the subject of intense interest in the arts, the media, or the government. The widespread enthusiasm of populist and “back to nature” movements for authentic and substantive rural culture came to a close as long ago as the onset of the World War I. It was then that the realities of rural existence last received any significant consideration in the political party platforms in either the Russian or the Austro-Hungarian Empire. In the post-war era, a vogue for the city and urban culture in general drove advocacy for rural concerns to the margins. Currently, the concept of the villager is an object suitable for exploitation only by mass-market pop culture or, in the short term, as a means for election to political office. The current Ukrainian situation plays witness to the transmogrification of rural culture from a symbol of national identity for the residents of a truant state into a platitudinous banality, a nominal marker of the “official culture” following the declaration of political independence. It is against this background that the directorial efforts of Bohomazov and Strzępka are rendered worthy of particular attention. 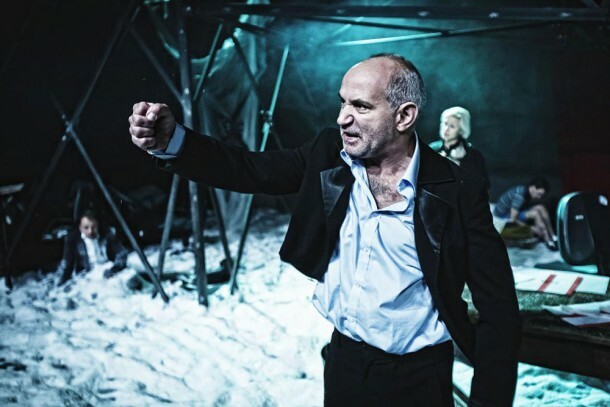 With his decision to stage the writing of Stefanyk for the second time–the first occasion was in 2003 at the “Free Stage” theatre–Bohomazov has selected an author who presents challenges for the theatre, both thematic and literary. With Stefanyk, the Kyiv director risks a writer whose work has left the bitter taste of rural tragedy in the mouth of many a Ukrainian schoolchild, and his stories have long been consigned to the reliquary of national classic literature. All of this could inspire fear of yet another instance in a long line of profane and superficial treatments—in the usual manner of Ukrainian academic theaters—of his material. Upon closer examination, however, Stefanyk’s work deserves more serious consideration. Here is revealed a Galician author representative of the forces in play at the turn of the 20th century. This was a time of abject poverty in the eastern Galician countryside and, following the failed battle for peasants’ rights in the strikes of 1902–1904, of mass emigrations for Germany and North America. Stefanyk, like most of the Ukrainian intellectuals of his day, was supportive of the “Ukrainian national project” and was deeply involved in social and political activism. The agrarian question was central to the platform of the radical political party to which the writer belonged. He frequently—and personally—made use of his status as Ukrainian emissary to the Austrian Parliament to advocate for the peasant cause. Correspondingly, his novellas crisply capture the relevant historical context and social ills of turn-of-the-century Galicia, employing them to worthy dramatic effect. With this attempt at relating these marginal and long-forgotten histories of the impoverished, Bohomazov produces a careful homage to the writer, and his deft handling of Morituri te salutant results in a creditable interpretation of a Ukrainian literary classic. The director chose nine novellas, each of which is treated in a self-contained production: May, unadorned episodes about the search for work; Christmas Eve, awaiting death in a cold hut on Christmas Eve; “Every Day a Holiday,” about the cruelty of landlords toward the peasantry; “Sons,” on the inevitability of death from hard labor; At the Tavern, All Alone, and Sin, documenting personal and family tragedies; and The Boundary, about our connectedness to the soil. Despite the absence of a unified plot, the director develops fully-realized characters from Stefanyk’s works, constructing a cohesive biography of Ukrainian village life. Drawing from romantic and realistic traditions, Bohomazov poeticizes Ukrainian peasant life, depicting the fullness of the villagers’ existence despite their lowly position in the social hierarchy. The characters endure travail and injustice with a meditative calm as if—rather than living them—they only observe their lives from the wings. The performances’ direction places the grim social abuses of the rural everyday into the mystical setting of ritual and observance, the harmonious repetition of life-sustaining, organic cycles, and the charmed interplay of the individual and his native soil. The director imparts the villagers’ quotidian existence with depth and substance, and the musical accompaniment—nearly every actor in the play sings—only serves to underscore the lyricism of Stefanyk’s prose. This agreeable inevitability of Ukrainian village life immediately—from the opening lines of the performance—draws in and beguiles the observer. But this performed agreeability is one of inertia. In constructing a nearly esthetically flawless staging, the director has stripped the characters of flesh and blood. The troubled Galician peasant championed by Stefanyk before the Austrian Parliament and detailed in his journalism is nowhere to be found. It is as if the struggles, which lay behind the all-too-common tragedies portrayed in the novellas, simply did not happen. They are heroes who, though deeply rooted in their land, are incapable of rising up to protect it, unwilling to actively engage in its defense. They are unready to reflect upon the cause of their suffering, simply accepting its inexorability. The Ukrainian village of the production presents merely a hologram of the past: an abstract world lacking concrete place and time, one that does not exist, and likely never has. The play’s characters bear greater resemblance to an interactive museum exhibit, reflecting nothing of reality or modernity. Are these, indeed, our grandfathers and grandmothers, our none-too-distant ancestors? One must labor long and hard to reach the rational conclusion that these rep resent a part of our own history. If the production of Morituri te salutant evidences one thing, it is that Ukrainian history remains, largely, for us a fiction and an abstraction. Between our present and our past lies the great gulf of our severed tradition, which no one has yet determined to bridge. While Dmytro Bohomazov has been laying bare the collective spiritual mystique of the peasantry, Monika Strzępka extracts a single figure—Jakub S—from his historical context and engages him not only in an examination of Poland’s problematic history, but of its current, ugly reality. Jakub S—Jakub Szela—was a popular peasant leader, celebrated for his defense of the interests of rural laborers before the nobility. He is credited as the instigator of the so-called “Galician Slaughter” of 1846, an anti-nobility, grassroots rebellion that occurred on the eve of the abolition of serfdom in Austria-Hungary (1848). In Polish folklore, he is presented as a heroic defender of the peasantry against class exploitation. Conversely, the nobility held Szela to be a traitor: a pawn of the Austrian authorities whose campaigns were directed against secessionist-minded Polish elites responsible for the Kraków anti-imperial uprising of 1846. This theatrical exhumation of Szela—or rather, the Szela myth—marks a bold departure from the norm. Classical Polish literature has addressed the character repeatedly, yet Szela himself manages to remain beyond the scope of officially constructed versions of Polish history. Based on the notion of a gallant nobility tirelessly engaged in the quest for independence, the mythology of Polish history has no place for a man like Szela in the received discourse. It is widely held that modern Poles are the worthy descendants of an independence-minded nobility, and while everyone has heard stories of country folk ancestors, no one is quite ready to share in their lineage. Stepping outside this romanticized mythology, the Strzępka-Demirski, director-playwright tandem relentlessly reminds the public that it has been placed squarely in opposition to the official version of events. The audience discovers that they have been placed in the decidedly uncomfortable position of acknowledging in themselves the mold and heritage of Szela—an outraged and unhinged roughneck lacking any vestige of the social graces or a noble ancestry. Reconsidering the roots of “Polishness,” the performance assembles a platform for reflection upon the possibility of whether contemporary Polish identity is indeed built upon a peasant foundation. What is the mechanism that facilitates the transformation of the baser drives into a progressive existence? Here is where Szela in village garb makes his break with the past. He finds himself in the modern day, where a young couple balks before securing a mortgage; where a successful manager reels from the effects of the financial crisis; and where an average family sits around the holiday table drinking heavily. He articulates his anti-serf thesis to modern Poles constrained to work in giant corporations and bound interminably to bank loans for airless living space somewhere in the Polish hinterlands. This stark comparison of modern capitalism with serfdom renders meaningless the gap between the problems of the previous century with those of today. The pronouncements of Szela are particularly resonant in the context of contemporary Poland’s post-crisis realities. Paweł Demirski’s Szela sets a vexing question before the modern Pole: “What would you do if you had one day to change your entire life?” What steps are members of the modern middle class ready to take in order to ensure that their dreams are not limited to an annual two-week vacation in Egypt? What personal ethos must the modern Pole develop in order to keep his deeply-rooted provincialism and unprogressive worldview from peeking out through his brand-name eyeglasses or the screen of his MacBook? The play is a call to honest self-reflection, an invitation to stop hiding and come to grips with one’s past, refusing to accept only those narratives that are expedient. It is not unremarkable that two fundamentally different directorial visions are attempting to portray the same group of peasants. Stefanyk is writing about eastern Galicia where he was born and lived nearly his entire life. Demirski’s “Szela” lived on the territory of western Galicia and Bukovina. Still, “our” and “their” Galicia demonstrate the radically opposed reference points that inform contemporary Ukrainian and Polish interpretations of their countries’ respective histories. 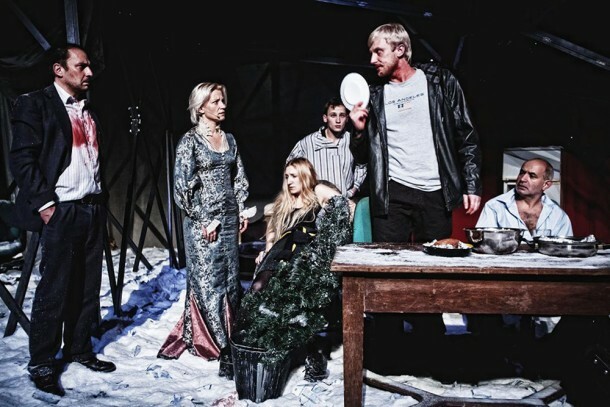 These two plays, among the most intriguing to appear recently in either country, are informative in evaluating the distinctions in Ukrainian and Polish attitudes toward the form and purpose of current contemporary live theatre. The striking—if tragic—story of the downtrodden Ukrainian masses contrasts markedly with the highly referential, awkward, and yet engaging Polish treatment. In the end, a Ukrainian audience gladly accedes to a cathartic experience while reflecting upon richly drawn landscapes, finally exiting the theatre, where it is met by an absent past and an uncertain present. The Polish theatre-goer, by contrast, leaves slamming the theatre door behind him and, preoccupied with thoughts of his origins, commences to hash over–loudly–his private and public impressions and conclusions with anyone willing to listen. Oksana Dudko, PhD (Lviv, Ukraine), is a cultural historian and theatre curator. She is a researcher in the Center for Urban History in Lviv, Ukraine. Also she is a program curator for theatre projects, including for the Festival of Contemporary Drama Drama.UA and the First Stage of Contemporary Drama in Lviv.